Koritni, founded by singer and songwriter Lex Koritni after the demise of Australia's Green Dollar Colour, brings their second release, Game Of Fools. Mostly recognized in their own country and around Europe, Koritni delivers another blistering disc of crackin' hard rock. Strength of Game Of Fools is definitely in its energetic delivery for there is little pause as the band rips into '155,' the full-throttle opener. This song as well as others like Roll The Dice, V8 Fantasy, Nobody's Home shows Koritni's singular effort marry solid catchy riffs with a relentless rhythm section. There's no doubt you've got 'hard' rock going here; at times I would even say it can border on metal while it still remains melodic. Additionally, Koritni seems to be maturing, or at least exploring current trends, as songs like You Vs Me and Tornado Dreaming have a distinctly modern, even post grunge, flavor which might appeal to an American audience. Conversely, after the first song or two, if you don't like Lex Korini's vocals, I believe you will find Game Of Fools bothersome or even monotonous at times because he shows little vary in his delivery. This is probably the single thing that puts me off. Mr. Koritni never seems to really sing. Rather, his delivery is more raw, gravel-throated, and often torturous, screaming or yelling. Sometimes it's downright sloppy as it never rises above the music (however, this could be due to the mix). To his credit, however, Mr. Koritni is an excellent songwriter with a good command of lyrical composition. 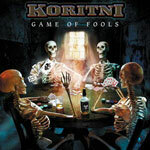 Koritni continues to deliver solid melodic hard, sometimes heavy, rock with abundant energy from catchy riffs, a solid rhythm section, and rippin' guitar solos. Game Of Fools is a good work only weighed down by Lex Koritni's predictable, and often, grating vocal performance.